The most crucial game of the last day was a loss of Warriors (24-9) in Bismarck on Friday night. Hosts were defeated by OKC Blue (24-9) 116-102. It ended at the same time the two-game winning streak of Warriors. It was a key game for the top position in the league. OKC Blue looked well-organized offensively handing out 29 assists. Great defensive blocking was one of the keys in this match when OKC Blue made 9 blocks. It was a good game for swingman Deonte Burton (193-94, college: Iowa St.) who led his team to a victory with 21 points and 5 rebounds. Swingman Scotty Hopson (200-89, college: Tennessee) contributed with 23 points for the winners. Guard Damion Lee (198-92, college: Louisville) answered with 29 points, 8 rebounds and 4 assists for Warriors. Both coaches used bench players which allowed the starters a little rest for the next games. OKC Blue have a solid series of three victories in a row. They maintain first place with 24-9 record which they share with defeated Warriors. Important game to mention about took place in Sioux Falls. Fourth ranked Texas Legends (13-22) saved a 3-point victory on the road edging second-best Sioux Falls Skyforce (22-13) 136-133 on Friday evening. Guard Gary Trent-Jr (198-99, college: Duke) stepped up and scored 39 points (!!!) and 7 rebounds for the winners and Trahson Burrell chipped in 24 points, 7 rebounds and 5 assists. The best for the losing side was point guard Briante Weber (188-92, college: VCU) with a triple-double by scoring 26 points, 10 rebounds and 11 assists. Texas Legends maintains fourth place with 13-22 record. Sioux Falls Skyforce lost third consecutive game. They keep the second position with 13 games lost. Texas Legends will play against Lakers (#4) in Los Angeles in the next day. Sioux Falls Skyforce will have a break next day. An interesting game for Knicks (19-16) which hosted in Westchester their close opponent Drive (13-18). Third ranked Knicks managed to get a 7-point victory 110-103. Billy Garrett nailed 26 points, 6 rebounds and 6 assists for the winning side. Henry Ellenson came up with a double-double by scoring 21 points and 13 rebounds for Drive in the defeat. Drive's coach rotated eleven players in this game, but that didn't help. Knicks maintains third place with 19-16 record having just eight point less than leader Santa Cruz W. which they share with defeated Drive. Drive at the other side keeps the third position with 18 games lost. Knicks will meet at home Greensboro Swarm (#4) in the next day. Drive will play against the league's leader Fort Wayne Mad Ants and it may be a tough game between close rivals. An interesting game for Fort Wayne Mad Ants (16-14) which played road game in Mississauga against their close opponent Raptors 905 (20-12). Second ranked Fort Wayne Mad Ants managed to get a 5-point victory 117-112. 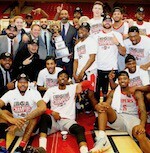 It ended at the same time the three-game winning streak of Raptors 905. It was a key game for the top position in the league. The best player for the winners was Alize Johnson who had a double-double by scoring 31 points, 14 rebounds and 6 assists. Raptors 905's coach tested ten players, but that didn't help to avoid defeat in this game. Fort Wayne Mad Ants keep a position of league leader, which they share with Erie Bay H. Defending champion Raptors 905 keeps the second place with 12 games lost. Fort Wayne Mad Ants' next day opponent will be Drive (#3) in Grand Rapids, which may be the game of the day. An interesting game for Capital City Go-Go (18-13) which played road game in Salt Lake City against their close opponent Salt Lake City Stars (16-16). Second ranked Capital City Go-Go managed to get a 5-point victory 118-113. It was a good game for Jordan McRae who led his team to a victory with 34 points (!!!) and 5 assists (on 10-of-13 shooting from the field). Capital City Go-Go's coach used a ten-player rotation in such tough game. Newly promoted Capital City Go-Go maintains second place with 18-13 record having just three point less than leader Santa Cruz W. which they share with defeated Salt Lake City Stars. Loser Salt Lake City Stars keep the second position with 16 games lost. Capital City Go-Go will have a break next day. Salt Lake City Stars will play on the road against Erie Bay Hawks and it may be a tough game between close rivals. There were no big surprises in other games of day 81: NAZ Suns were beaten by Lakeland M. on the road 108-99. Greensboro S. won against Maine RC on its own court 109-104. Austin S. unfortunately lost to Long Island N. in Uniondale 116-131. South Bay L. was rolled over Iowa W. at home 97-134. The most impressive performance of 81th day was 16 points and 12 rebounds by Amile Jefferson of Lakeland M.. The most crucial game of the last day was a loss of Warriors (24-9) in Bismarck on Friday night. Hosts were defeated by OKC Blue (24-9) 116-102. It ended at the same time the two-game winning streak of Warriors. It was a key game for the top position in the league. OKC Blue looked well-organized offensively handing out 29 assists. Great defensive blocking was one of the keys in this match when OKC Blue made 9 blocks. It was a good game for swingman Deonte Burton (193-94, college: Iowa St.) who led his team to a victory with 21 points and 5 rebounds. Swingman Scotty Hopson (200-89, college: Tennessee) contributed with 23 points for the winners. Guard Damion Lee (198-92, college: Louisville) answered with 29 points, 8 rebounds and 4 assists and Deyonta Davis (208-96, college: Michigan St.) added 20 points and 10 rebounds in the effort for Warriors. Five OKC Blue and four Warriors players scored in double figures. Both coaches used bench players which allowed the starters a little rest for the next games. OKC Blue have a solid series of three victories in a row. They maintain first place with 24-9 record which they share with defeated Warriors. No shocking result in a game when first ranked Magic (20-11) beat 5th ranked Northern Arizona Suns (7-27) in Lakeland 108-99 on Friday. Magic made 21-of-26 free shots (80.8 percent) during the game. They looked well-organized offensively handing out 21 assists. It was a good game for forward Amile Jefferson (206-93, college: Duke) who led his team to a victory with a double-double by scoring 16 points and 12 rebounds. Swingman Anthony Brown (199-92, college: Stanford) contributed with 19 points and 5 rebounds for the winners. Guard George King (198-94, college: Colorado) answered with 19 points and 7 rebounds and Hollis Thompson (203-91, college: Georgetown) added 13 points and 5 assists in the effort for Northern Arizona Suns. Both teams had four players each who scored in double figures. Both coaches tested many bench players and allowed the starting five to rest. Magic have a solid series of three victories in a row. They maintain first place with 20-11 record. Loser Northern Arizona Suns keep the fifth position with 27 games lost. Magic will have a break next day. Northern Arizona Suns will play at home against Blue Coats (#4) and it may be a tough game between close rivals. The game between closely ranked teams ended with 5th ranked Maine Red Claws' (10-20) road loss to fourth ranked Greensboro Swarm (15-16) 104-109 on Friday. Greensboro Swarm dominated down low during the game scoring 72 of its points in the paint compared to Maine Red Claws' 48. Greensboro Swarm looked well-organized offensively handing out 24 assists. Great defensive blocking was one of the keys in this match when Greensboro Swarm made 7 blocks. It was a good game for guard Jaylen Barford (191-96, college: Arkansas) who led his team to a victory with 27 points and 4 steals. Guard Joe Chealey (190-95, college: Charleston) contributed with a double-double by scoring 14 points, 6 rebounds and 10 assists for the winners. Greensboro Swarm's coach used a ten-player rotation in such tough game. Swingman PJ Dozier (198-96, college: S.Carolina) answered with 23 points, 9 rebounds and 6 assists and forward Robert Williams-III (208-97, college: Texas A&M) added 12 points, 14 rebounds and 4 blocks in the effort for Maine Red Claws. Four Greensboro Swarm and five Maine Red Claws players scored in double figures. They have a solid series of three victories in a row. Greensboro Swarm maintains fourth place with 15-16 record. Loser Maine Red Claws keep the fifth position with 20 games lost. Greensboro Swarm will face higher ranked Knicks (#3) in Westchester in the next day and it will be quite challenging to get another victory. Maine Red Claws will play at home against Herd and it may be a tough game between close rivals. An interesting game for Knicks (19-16) which hosted in Westchester their close opponent Drive (13-18). Third ranked Knicks managed to get a 7-point victory 110-103. Guard Billy Garrett (198-94, college: DePaul) nailed 26 points, 6 rebounds and 6 assists for the winning side and swingman Devon Baulkman (194-91, college: Tennessee) accounted for 23 points and 10 rebounds. Center Henry Ellenson (208-97, college: Marquette) came up with a double-double by scoring 21 points and 13 rebounds and guard Marcus Thornton (193-87, college: LSU) added 24 points respectively for Drive in the defeat. Five Knicks and four Drive players scored in double figures. Drive's coach rotated eleven players in this game, but that didn't help. Knicks maintains third place with 19-16 record having just eight point less than leader Santa Cruz W. which they share with defeated Drive. Drive at the other side keeps the third position with 18 games lost. Knicks will meet at home Greensboro Swarm (#4) in the next day. Drive will play against the league's leader Fort Wayne Mad Ants and it may be a tough game between close rivals. An interesting game for Fort Wayne Mad Ants (16-14) which played road game in Mississauga against their close opponent Raptors 905 (20-12). Second ranked Fort Wayne Mad Ants managed to get a 5-point victory 117-112. It ended at the same time the three-game winning streak of Raptors 905. It was a key game for the top position in the league. Fort Wayne Mad Ants made 24-of-27 charity shots (88.9 percent) during the game. Their players were unselfish on offense dishing 21 assists. 25 personal fouls committed by Raptors 905 helped opponents get some easy free throw opportunities. The best player for the winners was forward Alize Johnson (206-96, college: Missouri St.) who had a double-double by scoring 31 points, 14 rebounds and 6 assists. Guard Steph Hicks (198-92, college: CS Northridge) chipped in a double-double by scoring 21 points and 10 rebounds. At the other side the best for losing team was Canadian forward Mikyle McIntosh (201-94, college: Oregon) who recorded a double-double by scoring 15 points and 10 rebounds and guard Kyle Collinsworth (198-91, college: BYU) added 13 points and 8 rebounds respectively. Four Fort Wayne Mad Ants and five Raptors 905 players scored in double figures. Raptors 905's coach tested ten players, but that didn't help to avoid defeat in this game. Fort Wayne Mad Ants keep a position of league leader, which they share with Erie Bay H. Defending champion Raptors 905 keeps the second place with 12 games lost. Fort Wayne Mad Ants' next day opponent will be Drive (#3) in Grand Rapids, which may be the game of the day. An interesting game for Capital City Go-Go (18-13) which played road game in Salt Lake City against their close opponent Salt Lake City Stars (16-16). Second ranked Capital City Go-Go managed to get a 5-point victory 118-113. Capital City Go-Go looked well-organized offensively handing out 25 assists. It was a good game for swingman Jordan McRae (197-91, college: Tennessee) who led his team to a victory with 34 points (!!!) and 5 assists (on 10-of-13 shooting from the field). Swingman Troy Brown-Jr (201-99, college: Oregon, agency: Pensack Sports) contributed with a double-double by scoring 17 points and 11 rebounds for the winners. Capital City Go-Go's coach used a ten-player rotation in such tough game. Guard Isaiah Cousins (193-94, college: Oklahoma) answered with 21 points, 5 rebounds and 8 assists and guard Stephaun Branch (198-95, college: W.Georgia) added 15 points and 7 rebounds in the effort for Salt Lake City Stars. Four Capital City Go-Go and five Salt Lake City Stars players scored in double figures. Newly promoted Capital City Go-Go maintains second place with 18-13 record having just three point less than leader Santa Cruz W. which they share with defeated Salt Lake City Stars. Loser Salt Lake City Stars keep the second position with 16 games lost. Capital City Go-Go will have a break next day. Salt Lake City Stars will play on the road against Erie Bay Hawks and it may be a tough game between close rivals. Rather predictable result when first ranked Long Island Nets (22-10) won against 3rd placed Austin Toros (14-19) in Uniondale 131-116 on Friday. Long Island Nets outrebounded Austin Toros 52-40 including 39 on the defensive glass. They looked well-organized offensively handing out 27 assists comparing to just 11 passes made by Austin Toros' players. It was a good game for forward Theophilus Pinson-Jr (198-95, college: N.Carolina) who led his team to a victory with 33 points (!!! ), 5 rebounds and 4 assists. Guard Jordan McLaughlin (185-96, college: USC) contributed with 34 points (!!!) and 5 assists for the winners. Point guard Travis Trice-II (183-93, college: Michigan St.) answered with 25 points and forward Drew Eubanks (208-97, college: Oregon St.) added 10 points, 14 rebounds and 4 blocks in the effort for Austin Toros. Both teams had five players each who scored in double figures. Both coaches tested many bench players and allowed the starting five to rest. Long Island Nets have a solid series of three victories in a row. They maintain first place with 22-10 record. Austin Toros lost fourth consecutive game. They keep the third position with 19 games lost. Important game to mention about took place in Sioux Falls. Fourth ranked Texas Legends (13-22) saved a 3-point victory on the road edging second-best Sioux Falls Skyforce (22-13) 136-133 on Friday evening. Texas Legends made 20-of-26 charity shots (76.9 percent) during the game. Their players were unselfish on offense dishing 23 assists. Texas Legends brought some defensive toughness making 7 blocks. Guard Gary Trent-Jr (198-99, college: Duke) stepped up and scored 39 points (!!!) and 7 rebounds for the winners and swingman Trahson Burrell (201-92, college: Memphis) chipped in 24 points, 7 rebounds and 5 assists. The best for the losing side was point guard Briante Weber (188-92, college: VCU) with a triple-double by scoring 26 points, 10 rebounds and 11 assists and swingman Duncan Robinson (203-94, college: Michigan) scored 26 points and 4 assists. Both teams had five players each who scored in double figures. Texas Legends maintains fourth place with 13-22 record. Sioux Falls Skyforce lost third consecutive game. They keep the second position with 13 games lost. Texas Legends will play against Lakers (#4) in Los Angeles in the next day. Sioux Falls Skyforce will have a break next day. There was a minor upset when their close opponent Lakers (12-21) were outscored by fourth ranked Wolves (10-23) in Los Angeles 134-97 on Friday. Wolves made 25-of-28 free shots (89.3 percent) during the game. Wolves had a 42-26 advantage in offensive rebounds. They looked well-organized offensively handing out 31 assists comparing to just 18 passes made by Lakers' players. It was a good game for guard Marquise Moore (188-94, college: George Mason) who led his team to a victory with a triple-double by scoring 18 points, 15 rebounds and 12 assists. 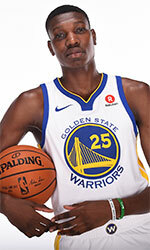 Point guard Darius Johnson-Odom (187-89, college: Marquette, agency: BeoBasket) contributed with 32 points, 6 rebounds and 5 assists for the winners. Guard Marcus Allen (191-94, college: Stanford) answered with 23 points (on 10-of-13 shooting from the field) and forward Travis Wear (208-90, college: UCLA) added 12 points and 10 rebounds in the effort for Lakers. Five Wolves and four Lakers players scored in double figures. The winner was already known earlier in the game, so both coaches allowed to play the bench players saving starting five for next games. Wolves maintains fourth place with 10-23 record which they share with defeated Lakers. Lakers lost third consecutive game. They keep the fourth position with 21 games lost. Wolves will face higher ranked Hustle (#3) in Southaven in the next day and it will be quite challenging to get another victory. Lakers will play on the road against Texas Legends in Frisco and it may be a tough game between close rivals.